Sophisticated population modeling provides theory to explain a wealth of empirical evidence. As most readers are undoubtedly aware, today is National Feral Cat Day. And at the risk of stating the obvious: NFCD has clearly become, to borrow a trendy phrase from social media, “a thing.” Now in its 14th year, there are hundreds of events going on around the country to mark the occasion. All of which must be terribly frustrating for TNR-deniers. 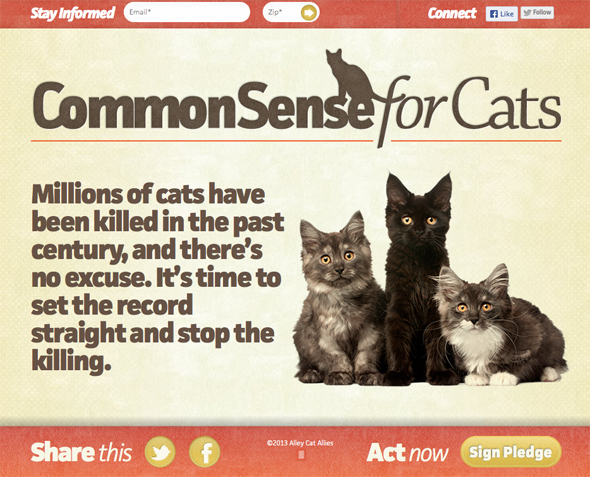 Thus, their increasingly desperate attempts to oppose, any way they can, TNR and community cat programs. It’s not clear exactly who these 33 slides are intended to help. After all, to anybody even remotely familiar with the issue, it’s immediately apparent that Sizemore’s claims—the “consequences” mentioned in the presentation’s title—are flimsy at best. Equally apparent: Sizemore and ABC are not—though ABC’s been on this witch-hunt for 17 years now—about to provide any solutions. Not only is the presentation available on ABC’s website, Sizemore’s now taking the show on the road. Last month, for example, he was in Ellenton, Florida, as part of a Coyotes and Feral Cats forum, hosted by the Suncoast Cooperative Invasive Species Management Area. Considering I’ve never donated one cent to the American Bird Conservancy, the organization has been very generous to me—at least in terms of blog content, courtesy of the various misrepresentations, red herrings, and outright lies used to rationalize and promote their ongoing witch-hunt against outdoor cats. You know what they say about judging a book by its cover. 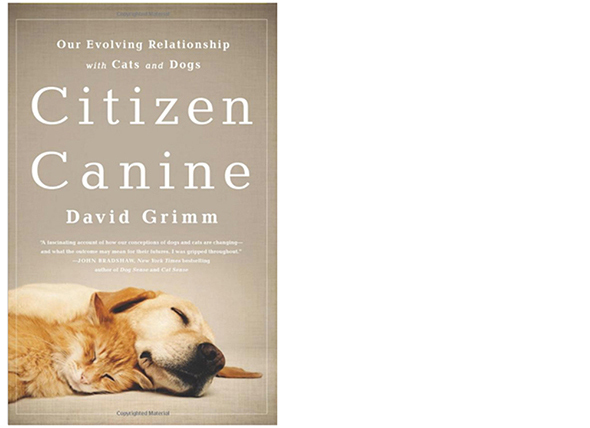 Well, don’t be fooled by the title of Citizen Canine—as its subtitle indicates, this book is about “our evolving relationship” with both dogs and cats. Using a combination of rigorous research and on-the-ground reporting, author (and online news editor of Science) David Grimm traces the journey of cats and dogs from domestication (such as it is, in the case of cats) through beloved family pet and into the present-day movement toward personhood. All of which makes for very compelling reading, even for those of us who work in animal welfare and are therefore familiar with most of the material. For other readers—and I hope there are many—Citizen Canine will likely be their introduction to contemporary hot-button animal welfare issues such as breed-discriminatory laws and TNR. And even the “insiders” among us might be surprised to learn, for example, of dogs with attorneys and the details of the Uniform Trust Code, which allows people (in some states) to include their pets (and perhaps their colony cats, too—I don’t know) in their wills. Plenty of good stuff for all of us, in other words. We were encouraged by [the U.S. Fish and Wildlife Service’s] recent statement from an FWS field office on free-roaming cats, a thoughtful and science-based letter to Escambia County, Florida. 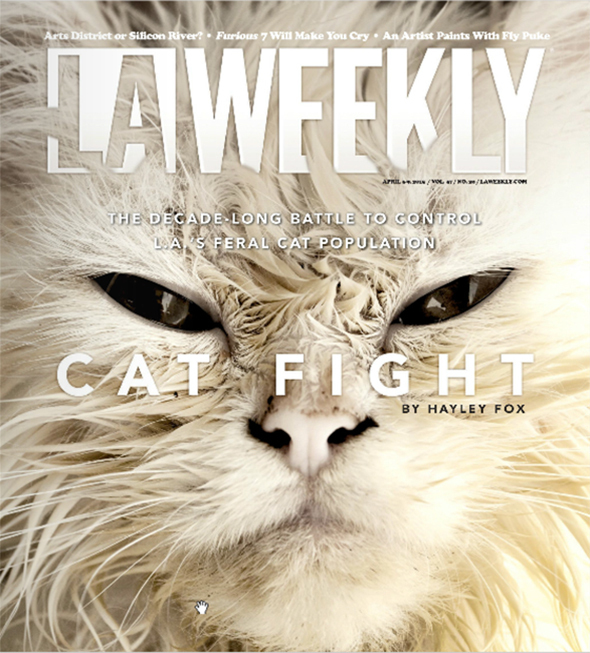 The letter expressed strong opposition to free-roaming cats within the U.S. ‘due to the adverse impacts of these non-native predators on federally listed threatened and endangered species, migratory birds, and other vulnerable native wildlife.’ It also opposed trap-neuter-release (TNR) programs that maintain feral cats in outdoor colonies. Trouble is, the U.S. Fish and Wildlife Service has no official position on free-roaming cats. Yet here’s this letter (PDF) written by USFWS staff, on official letterhead, explaining that the “agency strongly opposes free-roaming, domestic or feral cats in the U.S.,” and hinting that there may be legal repercussions if the county were to implement a TNR program. Which is why Best Friends Animal Society (my employer since May 2013) called out USFWS publicly, first with a national action alert and then with a blog post. As I’ve pointed out previously, USFWS has been back and forth on this for some time now, acting (when it suits their purposes) as if they do have a policy regarding free-roaming cats, and then backpedaling when they’re called on the carpet. So why not just issue an official policy and proceed accordingly? Because these things typically require a degree of transparency with which USFWS is apparently uncomfortable, as well as considerable public input (e.g., notification and a commenting period). This, then, is what ABC is endorsing: inappropriate action from a federal agency clearly contradicting its own official statements and violating the public’s trust. Not that this is anything new, of course. It was just a year ago that ABC was publicly endorsing similar behavior from—and a similarly too-cozy relationship with—the Centers for Disease Control and Prevention. Dare we ask—which government agency will ne next? Unfortunately, our critique of this badly flawed work was rejected by the journal. As editor-in-chief Mark Burgman explained, “the reviewers and handling editor have substantial concerns … the reviewers noted important and consistent concerns, the most significant of which is that the methodological issues raised in the comment were not sufficient to warrant publication.” Not surprisingly, my co-authors and I strongly disagree, and regret that Cheryl Lohr and Christopher Lepczyk were not required to defend their work (a trivial undertaking if, as the reviewers suggest, our concerns were off-base or overblown). One often hears that science is self-correcting. The present case, however, supports the assertion, made in a 2012 Atlantic article, that self-correcting science is largely a myth. A couple months ago, I heard about a slick browser plugin (sadly, available only for Chrome) that replaces the word literally with figuratively for websites, articles, etc. I (literally?) cannot describe just how appealing this is to my inner (and sometimes outer) language bully. Indeed, the thought of the enormous satisfaction sure to follow was almost (but not quite) enough to get me to switch browsers. Old news: Richard Conniff’s March 23rd op-ed in the New York Times, in which he used his experience of losing a cat he cared for as an opportunity to misrepresent TNR, and vilify animal welfare organizations that support it. Although Conniff’s piece lacks the kind of focus one expects from an op-ed in the Times, it’s clear to anybody familiar with the issue: he’s using all the familiar “science” and scaremongering to justify lethal roundups. And like so many others who have taken the same position, Conniff is happy to talk about anything except the evidence that lethal methods can do the trick. 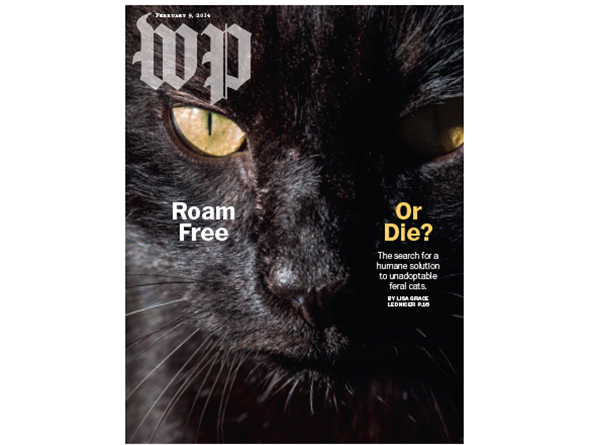 By the time readers had the print version of last week’s Washington Post Magazine in their ink-stained hands, the online version of its cover story, “Is it more humane to kill stray cats, or let them fend alone?,” had already been revised. A recent letter to the editor, published last month in the Journal of the American Veterinary Medical Association (PDF available here), reminds me of one of the reasons I’ve never enabled comments on this blog: the likelihood that some commenters would surely hijack the conversation—pretty much any conversation, however marginally relevant—to take up their own agenda. Although I’m a proponent of open dialogue (the name of this blog is no accident), I have neither the time nor the patience for people intent on making my platform their platform. Luckily, the JAVMA editors—dealing, as I’m sure they do, only with the most conscientious professionals—aren’t subject to such hijack attempts. Right? Results of a new computer model suggest that sterilization via vasectomy and hysterectomy is more effective than traditional spay/neuter at reducing the population of community cats. But the work raises several questions about the model’s validity—and more troubling ones about its implications for animal welfare. Since starting this blog a little more than three years ago, I’ve been describing TNR as a compromise—but the best option we’ve got in most circumstances. But what if there’s a better option, a non-lethal method for managing the population of stray, abandoned, and feral cats that reduces their numbers more quickly? According to a team of researchers at Tufts University, the answer is trap-vasectomy-hysterectomy-release, or TVHR. By eliminating the possibility for reproduction while leaving the cats “hormonally intact,” this method takes advantage of biological and behavioral characteristics not found in cats subject to traditional spay/neuter surgery,* thereby outperforming TNR in reducing colony size. The reason the American Bird Conservancy, National Audubon Society, The Wildlife Society, and others oppose TNR is, explained chief Animal Control Officer for Pompano Beach, Florida, David Aycock, during a barn-burner of a City Commission meeting Tuesday night, “that these animals are not safe out there—on their own, by themselves. Thank you, Alley Cat Allies! It doesn’t happen often enough—but every now and then, common sense, reason, and compassion win the day. Today is such a day. This morning Hillsborough County commissioners voted 6-to-1 in favor of Hillsborough County Animal Services’ recently announced TNR pilot program—part of director Ian Hallett’s proposal for reducing shelter killing (PDF). As I understand it, HCAS’s program would be modeled on the successful Feral Freedom programs underway in Jacksonville, FL, or San José, CA. However, it’s clear from people already involved with TNR in Hillsborough County that some key aspects of the program still need to be worked out. To my friends and colleagues in Hillsborough County, whose tireless efforts made this victory possible, congratulations! And thank you for all you’re doing on behalf of your community’s stray, abandoned, and feral cats! Less than two weeks after the “Community Cat Act” received unanimous approval from Florida’s House Agriculture and Natural Resources Subcommittee, the bill (SB 1320) is scheduled to be heard and voted on by the Senate’s Agriculture Committee Monday afternoon. As I reported in my previous post, the Florida Veterinary Medical Association came out in opposition to the proposed legislation last week, their “concerns” (PDF) a mix of misinformation and scaremongering (similar to the various complaints made by Audubon Florida when HB 1121 was before the Agriculture and Natural Resources Subcommittee).